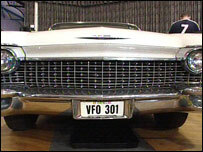 A pink 1961 Cadillac once owned by Elvis Presley has been sold at auction for £21,000 in Derbyshire. The 20ft long eight-litre Coupe de Ville was bought new by the rock-and-roll legend but was later purchased by a Yorkshire collector. The auctioneers - H&H Auctions - have not released the name of the Cadillac's new owner. The Cadillac, which is white with a pink roof and pink and white upholstery, has travelled 76,099 miles. It was originally valued at between £15,000 and £18,000. The car was part of the Yorkshire Car Collection first started by enthusiast Peter Black in Keighley in 1959. Mr Black owned the Peter Black factory which makes toiletries and footwear in the town. The collection of about 50 vehicles, dating back to 1894, has been looked after by classic car enthusiast and Presley fan Geoff Tuley in a garage near Keighley for the past 35 years. He said: "As an Elvis fan I will be sorry to see the car go. It has attracted a lot of attention from Elvis fans over the years. "One woman used to drive over from Warrington in a three-wheeled van every week. "And she would lay her cheek against the car because it belonged to Elvis. "English roads are too narrow - you would be all right driving it up and down the M1 but you could not go up to Grassington or around the Yorkshire Dales in it." Elvis's Cadillac was one of nine vehicles from the collection for sale by H&H Auctions at the Pavilion Gardens in Buxton, Derbyshire.